Spacious 4P apt. next to the Pijp! The apartment is within walking distance from the Heineken experience. At the Heineken experience you will the find the former brewery were the famous Heineken beer brand started its brewing activities 150 years ago. Today the day they produce and sell in more than 170 countries all over the world. Also you are very close the Albert Cuyp market. This market is already 100 years old and today the people from Amsterdam buy their groceries at this traditional market. If you don't want to experience the real Amsterdam vibe try some stroopwafels or bitterballen. The apartment has a great atmosphere so you feel right at home. The living room is cozy and bright because of natural light coming from outside. The kitchen is modern and fully equipped with all the equipment that you would like to see in a modern kitchen. In the bedrooms you will find comfortable beds for a good night. The bathroom is modern and has a beautiful rain shower to refresh yourself. 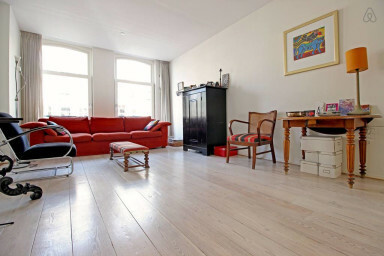 This apartment has everything you need for a great stay in Amsterdam. We love to welcome you and wish you a nice stay! The easiest way to get around the city is by bike, but you can also use public transport. Close to the apartment you can find tram 3 and bus 246 to get around the city. Stat of the art kitchen, with everything you need.